Pteridium aquilinum.Courtesy of the Brooklyn Botanic Garden.New York Metropolitan Flora Project.nymf.bbg.org (Accessed 6/2014). 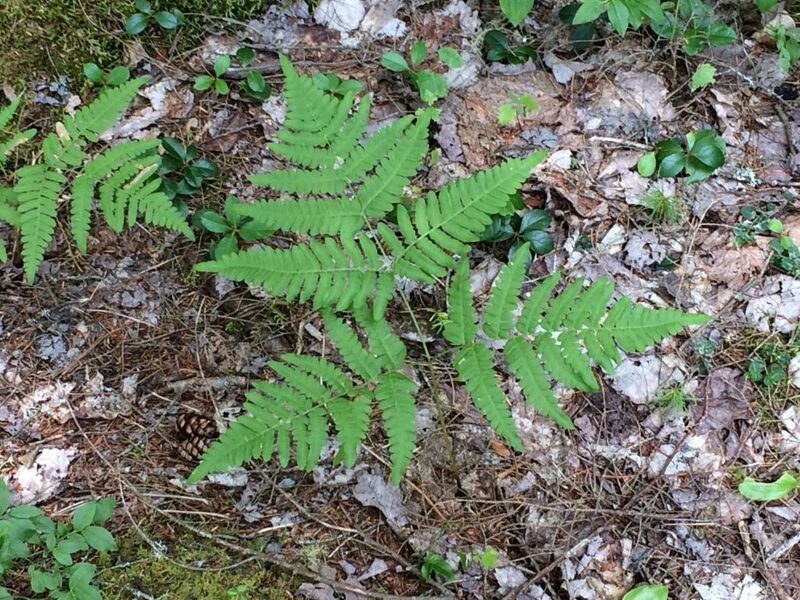 Pteridium aquilinum is a long-lived perennial fern to 1 m (or more) tall, clonal from extensive branching, hairy rhizomes, deeper rhizomes may be 2.5 cm diameter, roots may be associated with mycorrhizal fungi especially in very acid soils. Leaves emerging in May; arise singly, from smaller, shallower rhizomes, on a stiff, erect stalk, 30-70 cm tall; blade more-or-less triangular in outline, 2-3 times pinnately compound, with 3 main divisions, coarse, leathery, held horizontally. 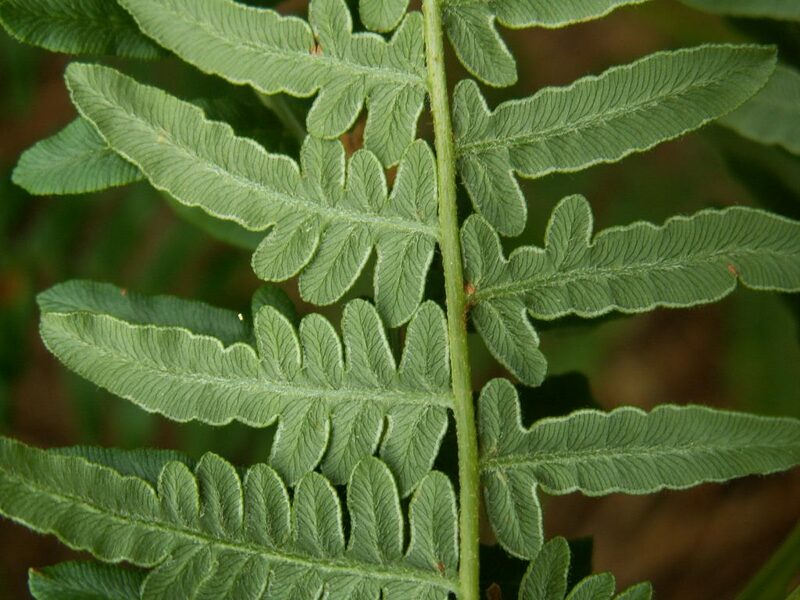 Pteridium aquilinum. leaf underside. en.wikimedia.org (Accessed 4/2017). Spore cases in lines near leaflet margins. Spore production occurs in late summer. Spores probably do not germinate until spring to form tiny, haploid gametophytes. Spores germinate best at pH 5.5-7.7 with adequate moisture, under laboratory conditions, rarely seen under natural conditions (Cody and Crompton 1975). Habitat: Burned areas, roadsides, open woods, usually in open on low nutrient acid soil. Rhizomes resprout after fires. 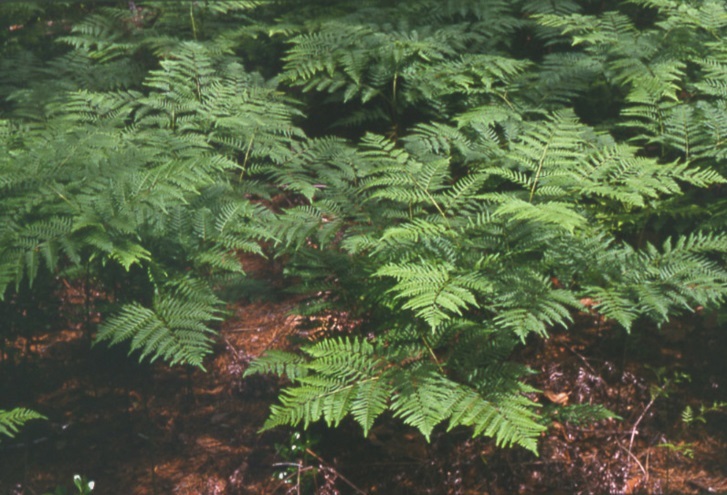 Pteridium aquilinum. (bracken) fern growth form. MBGargiullo.N.S.Ca.10/2016. Notes: Eaten by the larvae of numerous insects including: the bracken borer moth Papaipema pterisii; Homochlodes fritillaria; fern moths Callopistria sp. ; American angle shade moth, Euplexia benesimilis; (Covell 1984). Infected by the fungi: Ceratobasidium anceps; Cryptomycina pteridis; a leaf spot, Mycosphaerella indistincta, Dothidella osmundae (Ascomycotina); Sclerotinum deciduum (root or stem rot, Deuteromycotina); Uredinopus pteridis (a fir-fern rust, Basidiomycotina) (Agrios 1988; Cody and Crompton 1975; Sinclair et al. 1987). Bracken contains thiaminase, a toxin that breaks down thiamin (vitamin B1), causing deficiency (Kingsbury 1964; Cody and Compton 1975). It has also been shown to be carcinogenic and mutagenic and no parts should be considered edible. Other studies indicate that shikimic acid, a phenolic compound, is the major carcinogen in bracken (Cody and Crompton 1975).